"These teachers are constructivists, and they're the ones we remember." While I don't plan on filling my blog with quotes from other folks, I came across this one as a dug into a book that I used for a class about eight years ago. "During a workshop several years ago, a teacher, reflecting on her own education, noted that the teachers who influenced her most were the few who made difficult concepts accessible by seeking to understand what she knew at the time. We have heard many people recount similar stories about their most memorable teachers. For the most part, these remarkable teachers mattered so much because they were less concerned about covering material than they were about helping students connect their current ideas with new ones. These teachers recognized that learning is a uniquely idiosyncratic endeavor controlled not by them but by their students, and they knew that conceptual understanding matter more than test scores. These teachers are constructivists, and they're the ones we remember." "Wisdom is not the gathering of more facts and information, as if that would eventually coalesce into truth. Wisdom is precisely a different way of seeing and knowing... I suggest that wisdom is precisely the freedom to be present. Wise people always know how to be present, but it is so much more than that. Presence is wisdom! People who are fully present know how to see fully, rightly, and truthfully. Presence is the one thing necessary, and in many ways, the hardest thing of all." In my district, students are working on the personal narrative mode of writing during first semester. Each year, many of my students tell me that they don't have anything to write about. For some, that's true. They don't go very far from home or have opportunities for experiences that expand their minds. For others, I believe it is a matter of not paying attention to life. A variety of sources put the idea of a writing journal in my head. The idea goes by many different names, but essentially I wanted a place that was separate from their writing notebook that contains the material they are drafting, revising and editing in the classroom. Personally, I have used journals for about fifteen years to capture my thoughts, ponder life, and collect quotes, pictures, and other items that strike a cord with me. I wondered if developing a similar practice of paying attention would help improve my students writing. We began our writer's workshop by reading the first dozen or so pages of Nothing Ever Happens on 90th Street. As we read, we made note of the advice that was offered to Eva, the main character who couldn't find anything to write about. 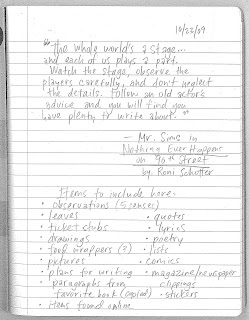 We focused on Mr. Sim's advice (see image at the right) and began to talk about how we could pay attention to the "stage"" and the "players" using a writing journal. I shared that I had seen a blog post the previous week at Two Writing Teachers that contained a video showing what one of the teachers includes in her writing journals. Of course they wanted to see it, so I pulled it up and we watched it together and then expanded our list of items we could include in our writing journals. I gave them the choice of either bringing in a journal or using one of the spiral notebooks I had in class. On Friday we wrote Mr. Sim's quote on the first page and then made a short reminder list of some items to put in our writing notebooks this weekend. I'm hoping that not only will their writing journals be a source of writing ideas, but that they will also create a spark and interest in writing that many are expressing at this point in the year.